Proteas are shrubs that vary from a low, spreading habit to tree-like habit 20 feet tall. All proteas are adapted to grow in hot climates, but the 1,500-plus species of proteas are adapted for different altitude, soil type and soil moisture. There are three leaf types, but many leaf shapes. Isobilateral protea leaves are the same on both sides. The leaves are upright to face the sun in both the morning and afternoon, but shade the sides at noon to save water. Some are branched. Terete protea leaves are short, thin and cylindrical, like pine needles or rosemary. Their compact size minimizes surface area where water can be lost. Some are branched. Canaliculate protea leaves hug close to the stem so that they shade the stem from heat while they protect the soft inner-leaf surface, where pores take in carbon dioxide for photosynthesis. To survive fire, some protea burn, then grow back from a woody tuber on their roots. Other protea have seeds that stay dormant in ant tunnels until high heat causes germination. Some protea hold their seeds on the dead flower head until a burn releases them. 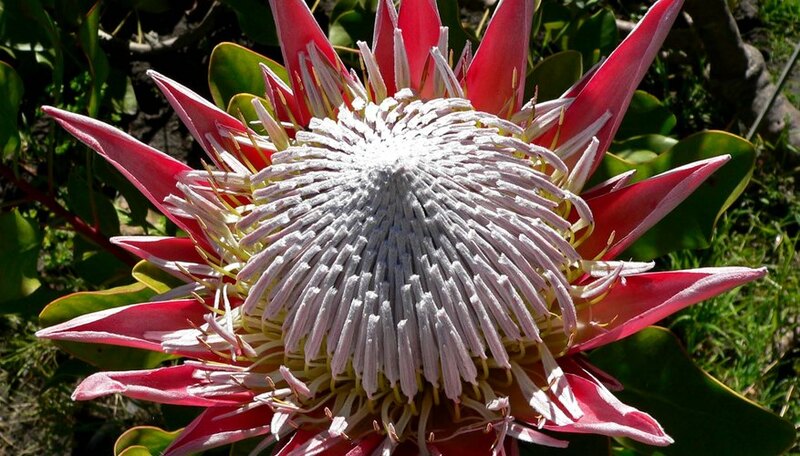 Protea are found only in the Southern hemisphere, mostly in Cape Province, South Africa. Members of their family, proteacea, are also found in New South Wales, Australia, and in South America.